Top Contributors - Julie Schuermans, Emma Guettard, Free Picke, Blondeel Jonathan and Simisola Ajeyalemi Read more. Hypermobility syndrome is different from localized joint hypermobility and other disorders that have generalized joint hypermobility, such as Ehlers-Danlos Syndrome, Rheumatoid Arthritis, Systemic Lupus Erythematosus, and Marfan Syndrome. HMS may occur also in chromosomal and genetic disorders such as Down syndrome and in metabolic disorders such as homocystinuria and hyperlysinemia. Laboratory tests are used to exclude these other systemic disorders when HMS is suspected. The pathophysiology in Hypermobility Syndrome is not yet fully understood, it appears to be a systemic collagen abnormality. The abnormality in collagen ratios is related with joint hypermobility and laxity of other tissues. The ratio of collagen (type I,II and III) is decreased in the skin. The diagnostic criteria for HMS includes joint abnormalities but it also affects cardiac tissue, smooth muscle in the female genital system and the gastrointestinal system. HMS also affects the joint position sense. Joint hypermobility happens most often in children and reduces with age. Joint mobility is highest at birth, there is a decrease in children around nine to twelve years old. In adolescent girls, there is a peak at the age of fifteen years, after this age the joint mobility decreases, as well in boys as in girls. Hormonal changes that occur in puberty by adolescent girls, will influence the joint mobility. For a diagnosis to be made either both of the major criteria must be present or 1 major and 2 minor or 4 minor. 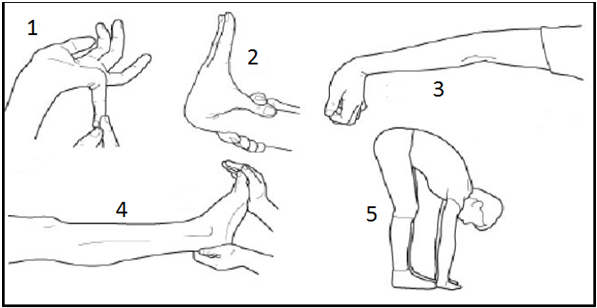 A passive dorsiflexion of the little finger above 90degrees (1 point for each hand). Bringing the thumb passive against the ventral side of the forearm (1 point for each thumb). According to the Beighton and Horan criteria, generalized joint laxity is present when four or more of five tests are positive, including contralateral knee hyperextension. In fact, there is no universal agreement on a threshold for BJHMS, some researchers use a Beighton scale score of 5/9, other researchers use a score of 6/9 and still others use a modified score of 3/9. Kinesiophobia: Tampa Scale for Kinesiophobia (TSK-I) is a questionnaire to measure pain and pain-related fear of movement. It can be used for patients with musculoskeletal complaints. This questionnaire has two sub-scales: “evaluating activity avoidance” ( a belief that activities who cause pain should be avoided) and “harm” (a belief that pain is a sign of damage of the body). Fatigue: Fatique Severity Scale (FSS) is a scale that quantifies the fatique intensity. This scale has a high internal consistency and validity. FSS exist out 9 items with a 7-point response format that indicates the degree of agreement with each item. Pain: Numeric Rating Scale (NRS) is an 11-point numeric scale to roughly measure any kind of pain. Quality of Life: The Medical Outcome Study 36-item Short Form Health Survey (SF-36) is a survey to evaluate aspects of health that are most closely related to quality of life. It consists of 36 questions that measure 8 domains: body pain, physical functioning, physical limitations, general health, vitality, social functioning, emotional limitations and mental health. Visual analog scale was used to assess musculoskeletal pain. Quality of life was evaluated by a Short Form 36 questionnaire (SF-36). For HMS, there is no medical management. To control pain you can use NSAIDs (Non-steroidal anti-inflammatory drugs) or acetaminophen. Active mobilisation exercises: shoulder rolls, arm circles, neck rotations, neck lateral flexions, wrist circles, side flexions of the spine, thoracic rotations in sitting. (Level of Evidence: 2A) Closed chain exercises are good exercises in many regards: it may reduce strain on injured ligaments, augment proprioceptive feedback, and optimise muscle action. In the studies by Sahin et al. (Level of Evidence: 1B) and Ferrell et al. (Level of Evidence: 4) they trained specific with the knee joint, whilst the other two studies incorporated whole body exercise interventions to treat joint hypermobility syndrome. Re-train dynamic control: once a ‘neutral’ resting position is achieved, re-training of specific muscles to maintain joint position while moving adjacent joints (hip flexion while maintaining spinal neutral) Dynamic control will be exercised with daily activities or sports. Because hypermobility syndrome can excist with other symptoms and complaints, it is important that physiotherapists can diagnose hypermobility syndrome. According to several articles physical therapy for HS patients includes education of hypermobility syndrome, activity modification, stretching and strengthening exercises for affected joints and osteopathic manipulative treatment.